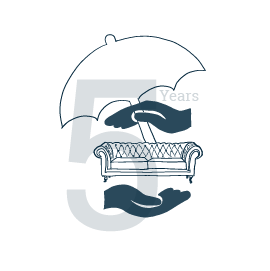 For $149 or 10% of the purchase price of your furniture (whichever is greater) Reeds offers a 5 Year Worry Free Furniture Protection Plan to provide you with Worry Free furniture protection against accidents. Uniters Warranty does not protect against jaws or claws. With UnitersPure you get expert assistance and live support from UnitersPure warranty service center. You get access to and special pricing on most of UnitersPure cleaning and care products. You get access to UnitersPure by phone or e-mail within 15 days from discovery of an accident (www.uniterspure.com). Download the Uniters app for Uniters Service Centers, call the service center at (866)213-6702 during business hours, or go to www.unitersna.com for service on your protection plan. *Please note the "underwritten" plan is inclusive of the manufacturer's warranty; it does not replace the manufacturer's warranty, but provides certain additional benefits during the term of the manufacturer's warranty. Losses covered by the manufacturer during the manufacturer warranty period are not covered under this plan and are the responsibility of the manufacturer. Uniters Pure Balance Extended Five Year Protection Essential Program covers against accidental damage plus structural and electrical protection for five years. Contact Uniters on the website, or by phone at the service center at (866)213-6702 within 15 days from discovery of an accident. For stains, UnitersPure first provides you with professional cleaning advice including sending out free products if necessary to remove the stain. If the stain persists, UnitersPure then sends out a certified Service Technician to professionally remove the stain. For all other covered accidents, UnitersPure sends out a Certified Service Technician to professionally repair the item. If UnitersPure is unable to remove a stain or repair the damage, they replace the affected item or replace the entire piece of furniture free of charge. If your furniture is no longer available, you can reselect new furniture of equal or lesser value. Please read your limited warranty for complete coverage details. In cases where there is a discrepancy between the document and the limited warranty, the limited warranty will govern. What does Pure mean in UnitersPure? It means UnitersPure produces safe, natural and environmentally-friendly products using only high quality ingredients. The Home Care essentials included in your gift bag with the purchase of the Platinum Protection Program are all Water-Based, Biodegradable, VOC-free, Phosphate-Free, Ozone Friendly and are free of any Hazardous Air Pollutants (HAP's). Pure also means that their product packaging incorporates recycled paper, and even the sponge is soy-based. It also means that they stand behind every one of their products with a Pure Promise...it's UnitersPure committment to prompt customer service should you ever need assistance and your true satisfaction in the performance of UnitersPure products. UnitersPure wants you to feel good about brining UnitersPure products into your home because they truly are good for your furniture, good for the environment and good for your family. Clean, care and protect with pure confidence. Go to uniters.com to learn more about this plan, learn about the administration of this plan, and learn what the plan does not cover.